Icons My Inspiration. My Motivation. My Obsession. With a foreword by Eddy Merckx The world of professional cycling is fraught with fierce competition, fervent dedication and unerring ambition, and only a handful of competitors reach iconic status. 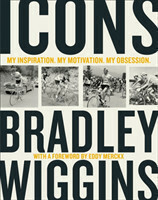 Among them is Sir Bradley Wiggins - a man uniquely placed to reflect on the history of this remarkable sport and its unforgettable titans.